Broadcasters stream video while connected to LavaView.com. We send the live feed to your audience. The viewer, while connected to LavaView.com, may watch the event on their computer, TV or project the event to another large audience. With LavaView.com, it is easy to broadcast and view live video. C3 There is no cost to the broadcaster. The viewer pays-per-view to watch your live event. You set the ticket price. Also we don't show ads or promotions of any type on or next to any live video content ever. A3 You, the broadcaster, have full control over all aspects of the broadcast. You control the time and cost of the tickets to view your broadcast. You also can place LavaView right into your webpage for a fully customized viewer experience. P9 Broadcasters are paid 70% of the ticket price. You receive payment via email and are able to download your funds immediately. Referral affiliates earn 5% and that is nothing to sneeze at. F3 We've listened to our customers and they made it clear that they require flexibility in order to be successful. 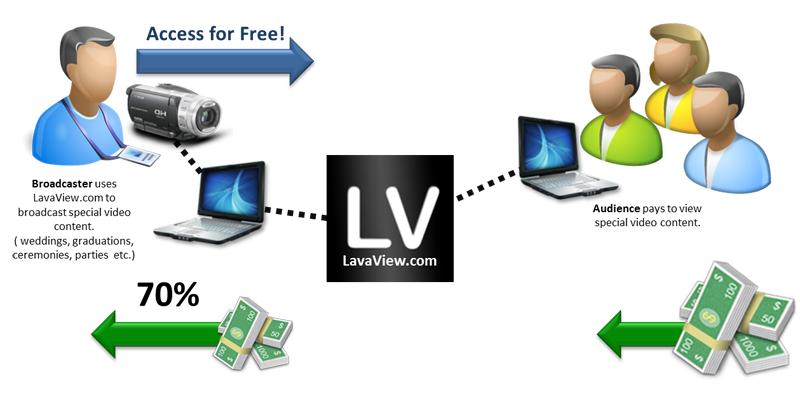 LavaView is built to be easy to use and flexibile enough to address various business needs with no ads!